Hanky Blanks is dedicated to being your favorite place to purchase hemstitched hankies, runners, dresser scarves, and placemats. We offer personalized service and will do our best to supply you with the blank sizes you need to make that special gift or heirloom. We have chosen the most common sizes for our hemstitched handkerchief blanks, placemats and runners. They range in size from 6" x 6" to 12" x 36". They come with or without hemstitching (small holes running along the hem for crocheting or tatting). Please indicate your preference when adding to your shopping cart. All of our blanks are made from a good quality, medium weight, cotton/poly blend material. Custom sizes are available on request. Please see the Specials page for more info. 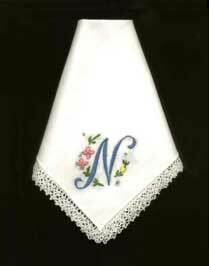 We also offer special packages such as The Hanky Baby Bonnet and Wedding Hanky. We will be changing our specials from time to time so please check back. We have added a new shopping cart for your convenience. The shopping cart allows you to buy online with your credit card; mail your order to us along with your check or money order; or fax your order to us with your credit card information. Sorry, no COD's. All of our blanks have a money back guarantee. If you are dissatisfied with the product, we will do our best to make it right, or you can send it back! We want to make your shopping with us a pleasant experience. Please see the info page to read about our return policy, mailing address and wholesale information. Thank you. Remember all those wonderful vintage and antique patterns your Grandmother and Great Grandmother used to crochet beautiful heirlooms? You can view several edging patterns by following this link.